I like to call myself a good cook. In reality, I’m a good direction-follower. I can follow a recipe like it’s my JOB! Adventurous to me, is substituting skim milk for whole milk. So imagine my surprise when I ROCKED my own socks off with beef fajitas tonight! We have half a beef in the deep freezer and I had gotten stew meat out about a week ago. It’s been over 70 degrees for the last two weeks…I’m not making stew. This morning, I decided to step outside my comfort zone and I put a package (1 lb) of stew meat in the crockpot with some spices…because I’m lazy I like to plan ahead. At Aldi (woot woot! ), I got a “variety” package of bell peppers, a bag of tomatoes on the vine, an onion and tortilla shells. I think it was a total of about $3. Shredded lettuce from Walmart (my Aldi doesn’t have shredded…boo). Put meat in crockpot (I used a small one) and add 8-12oz of water. Mix Cumin, onion powder, garlic powder, s&p and sprinkle over meat. Set crock on low, cover and leave for 6 hours. 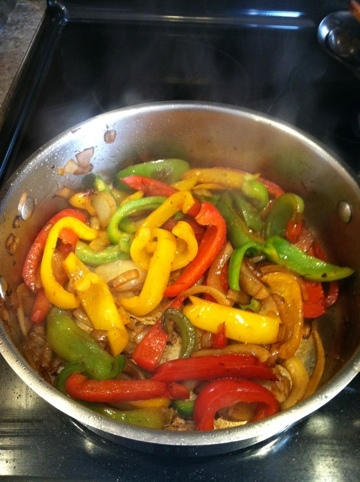 In the last 30-45 minutes, sauté onion and peppers in a large skillet, sprinkling some more spices on top, until brown but still tender (not soft). Add tomato, beef and a few spoons full of water/juice from crockpot. Let simmer 10 minute or so. That looks so yummy! I haven’t had fajitas in forever! I am so glad you’re back to blogging! I missed you so!